A 1959 Ferrari 250 GT Competizione Alloy Berlinetta will headline the 2015 Bonhams Quail Lodge car auction during the Monterey classic car week in August. 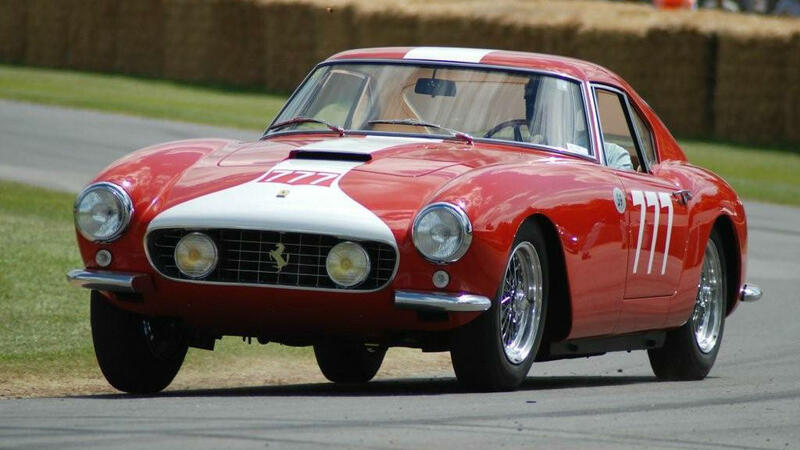 This “Tour de France” Ferrari comes with a pre-auction estimate of $9 to $12 million. Bonhams hope to achieve over a million dollar on 15 of the cars on offer. The following cars have pre-auction estimates of a million dollar or more for the Bonhams Quail Lodge classic car auction on August 14 in Carmel near Monterey in California. In 2014, Bonhams set a new auction world record when the 1962 Ferrari 250 GTO sold for $38 million – the highest price ever paid for a car at public auction. Such result is not in the offering this year but Bonhams still have a remarkable collection of cars on offer including numerous valuable Ferraris. Bonhams top result is expected at the 2015 Quail Lodge sale from a 1959 Ferrari 250 GTO Competizione Alloy Berlinetta. This rare 250 Competition Ferrari is in a perfectly restored condition, which led to it being awarded a Platinum Award at the 2015 Palm Beach Cavallino Classic. The car was the 5th of 7 interim LWB cars produced with SWB-style coachwork. The car finished third over all in the Tour de France series of races in 1959 – only days after the car was completed. It was first overall at the 1960 Glen Classic at Watkins Glen. The pre-auction estimate is $9 to $12 million. Ferrari designed the 288 GTO for homologation purposes to participate in Group B rallying. Although the series was axed before the Ferraris could race, the 272 Ferrari 288 GTOs produced were sold before Ferrari could build them. The 1985 Ferrari 288 GTO on offer has an estimate of $2.5 to $3 million. The car has completed on 7,432 km since new, which is a shame for a car capable of a top speed of 189 miles per hour. RM Sotheby’s has a similar car on offer. The 1971 Ferrari 365 GTS/4 Daytona Spider was the 16th of only 25 European specification cars built making it the rarest of Daytona models. It comes with an estimate of $2.5 to $3 million. The 1951 Ferrari 212 Inter Cabriolet with coachwork by Vignale is in a perfectly restored condition that saw the car finishing second in class at the 2014 Pebble Beach Concours d’Elegance. Its pre-auction estimate is $2.4 to $2.8 million. The 1990 Ferrari F40 is the newest car on offer at Bonhams that is expected to sell for over a million dollar. The pre-auction estimate of $1.2 to $1.4 million is inline with what well-maintained F40s currently achieve at sales. This car is one of 213 produced in US specification. The 1949 Veritas Scorpion Cabriolet is listed for sale without a pre-auction estimate. These cars are extremely rare – probably only 78 were ever produced and only one other example is known to exist in the USA. These cars were produced after the Second World War by BMW engineers and came with a 328-type engine and bodywork by Spohn. The 1954 Mercedes Benz 300 SL Gullwing Coupe (estimate $950,000 to $1,2000,000) on offer was the 105th Gullwing produced. The car is in a very well-maintained, original condition and has never been restored. It has covered only 34,000 miles with the leather interior believed to be the original too. The less iconic, but far more practical, 300 SL Roadsters usually sell for slightly higher prices than the Gullwing Coupes. The 1957 Mercedes Benz 300 SL Roadster on offer has pre-auction estimate of $1.1 to $1.3 million and has done nearly three times more mileage than the Gullwing in the same sale. It comes with a soft top and a rare hardtop. The 959 was Porsche’s first true super car. It was the fastest road car at its launch featuring technology other manufacturers were still researching. Like the Ferrari 288 GTO, it was inspired by the ambition to enter Group B rallying with at least 200 street-legal units needed. Porsche built 284 cars in total. Porsche 959s has achieved results in excess of a million dollar in recent months, which to a large extend explain why they are available at auctions in larger numbers of late. Gooding, RM Sotheby’s and Rick Cole each also have a 959 on offer at Monterey 2015. Being over 25 years old – these cars also benefit from different importation laws in certain states and countries, which also make the 959 attractive to some American buyers. The 1987 Porsche 959 Komfort (estimate $1 – $1.25 million) on offer at Bonhams comes with a performance upgrade to S specification. The car has covered less than 5,000 miles since new. Usually, the 8V is the only post-war Fiat that could compete somewhat with Ferraris on price. However, at recent auctions, these rare cars have not always realized multimillion prices, or reached the reserves. The 1953 Fiat 8V Supersonic on offer is indeed a rare vehicle – only 15 of these 8V Fiats with Supersonic bodies by Ghia were ever produced. This car has just received a comprehensive 8-year restoration and is ready for display or classic rallies. Its pre-auction estimate is $1.8 to $2.4 million. The 1955 Lancia Aurelia B24S Spider America (estimate $1.8 to $2.4 million) was raced by Lou Brero. The car is in a perfectly restored condition. Siata is a lesser-known Italian carmaker with the 1953 Siata 208 S Sports two Seater a rare vehicle. It was originally fitted with an engine left over when the Fiat 8V production stopped due to a lack of demand but was later fitted with a more powerful Shelby Cobra power unit. (The original engine is included in the sale.) The estimate is $1.1 to $1.3 million. The 1967 Lamborghini Miura P400 (estimate $850,000 – $1,000,000) was the 37th Miura produced. It is in an exceptionally original condition having had only two owners since new.